Bad news and good news for sharks and rays this month. Researchers have found that a quarter of them are threatened with extinction, even so, Western Australia is waging war on large sharks and killing as many as possible. More enlightened is neighbouring Indonesia, which has given full protection to Manta Rays in all its waters, and Mexico, which has banned the fishing and capture of Great White Sharks. More on the Great White Shark below. Looking for some feeedback on Marianas caribbean water sports out of Punta Cana. Any comments would be helpful. Can anyone help Ed? Post at Google+ or e-mail us and we'll pass your message on. Great white sharks have been much in the news recently. Most significantly in relation to the Australian shark cull which is supposed to protect people from being attacked by the sharks on the beaches. More shocking still, though, is the realisation that shark nets are made not to be a barrier but a trap. They are designed to kill sharks longer than 2 metres. According to the Shark Angels group, in South Africa alone over 45000 sharks, turtles, dolphins and rays have been killed by nets and drumlines in the last 30 years. Whilst (some) Australians are killing Great white sharks (Carcharodon carcharias), new research has found that they live 50 years longer than previously thought - to over 70 years of age! Sharks are typically aged rather like counting tree rings, by counting growth band pairs deposited in their vertebrae. However, sharks grow more slowly as they get older and the band pairs become too thin to read. Using this method under-estimates the age of older sharks. A new study used bomb radiocarbon dating on eight sharks caught between 1967 and 2010 in the Northwest Atlantic Ocean. This technique uses the discrete radiocarbon pulse in the environment caused by the detonation of nuclear bombs in the 1950s and 1960s as a “time stamp”. Radiocarbon levels incorporated into the band pairs are measured and related to a reference chronology to determine the absolute age of a fish. 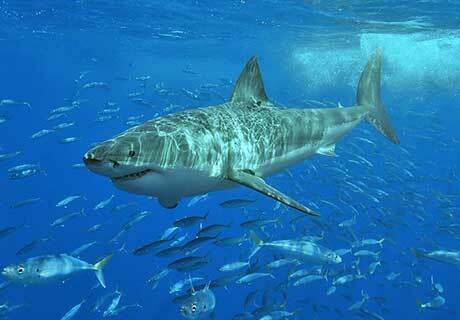 White sharks travel thousands of miles across open oceans. 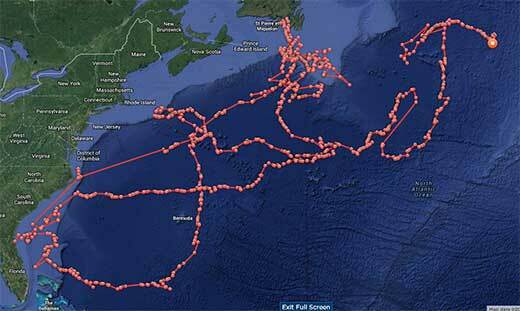 There is a great site from Ocearch which lets you see the track individual sharks have taken. Go to http://www.ocearch.org/ and choose a great white shark to track. the east coast of America to Canada and the North Atlantic. But not by astronauts or space tourists. Scientists from the British Antarctic Survey are using satellite images to assess populations of southern right whales. Queensland has killed hundreds of sharks with baited hooks and nets since 1962, while New South Wales nets snare even more. More nets or drums with baited hooks are being set at other great white sharks strongholds near the Reunion Island in the Indian Ocean, and in South Africa. The outcome is inevitable: the great white, now down to an estimated 3,500 individuals, will move from being "vulnerable to extinction" to "endangered with extinction", to extinct. Barnett's way is for jellyfish to rule. The hope lies in that public revolt. Indonesia has protected both species of Manta Rays. "As the world's largest archipelagic nation, it is important for Indonesia to maximize economic returns from our marine resources," said Sharif Sutardjo, Indonesia's Minister of Marine Affairs and Fisheries. "This action will fully protect both species of manta rays in Indonesian waters and ensure improved management of their populations." Mexico has decided to set a permanent ban on the capture of great white shark. The UK Government has refused to act against bottom trawling, which has turned Britain's seabed ecosystem into a wasteland. The first attempt to mine the sea floor has run aground, as the mining company announces it is suing its partners in the Papua New Guinea government. Australian scientists are asking the public to contribute photos of sea lion snouts to help develop a new method of identifying the animals. Crude oil interferes with fish heart cells. The toxic consequence is a slowed heart rate, reduced cardiac contractility and irregular heartbeats that can lead to cardiac arrest and sudden cardiac death. A British university is growing mats of seagrass to replace previously damaged habitat. Scientists in Australia are working to classify a new species of giant jellyfish that washed up on a beach in Tasmania. The species is part of the Lion's Mane group.